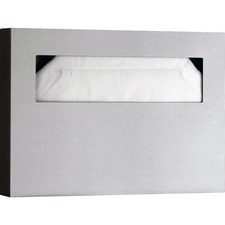 Toilet seat cover dispenser features a satin-finish, stainless steel construction to deliver years of use without worry. Large, beveled opening allows easy cover removal without tearing to prevent wasteful use. Easy-to-install design can be securely mounted to a wall or toilet partition for convenient use in an optimal location. Dispenser is designed for use with 250 single covers, 250 half-fold covers or one box (each sold separately). Marketing Information Toilet seat cover dispenser features a satin-finish, stainless steel construction to deliver years of use without worry. Large, beveled opening allows easy cover removal without tearing to prevent wasteful use. Easy-to-install design can be securely mounted to a wall or toilet partition for convenient use in an optimal location. Dispenser is designed for use with 250 single covers, 250 half-fold covers or one box (each sold separately).